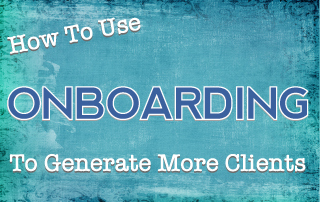 Do you use an ‘onboarding’ process or system for generating new clients? I saw the post below and really liked what Femke van Schoonhoven had to say. I’ll be adding my own commentary in the process and how you can apply it to your creative business. If you’re not familiar with ‘onboarding’ – the term is mostly used in HR departments, however, it’s become somewhat of a ‘buzzword’ these days. Basically, onboarding is a ‘system’ you design and follow when you receive a new inquiry. You’ll do the same steps every time to provide your potential new clients the best possible experience. It’s strategic and something you’ll adjust over time as you learn what’s most effective and helpful for your clients. 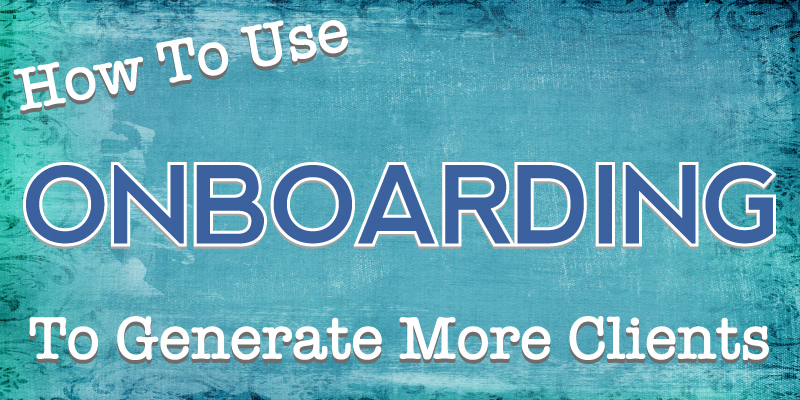 Read Femke’s article below for ways you can maximize or establish your own onboarding system. Every touch point you have with a client lead is an opportunity to provide them with a remarkable onboarding experience. Based on how you deliver those experiences, it could lead to signed contracts and more exciting work in the future. You’re a creative working with clients. You’re running a clientele business, which means you’re offering a service: creative work in exchange for monetary payment (if you’re doing it for free, I hope it’s not in exchange for exposure!). If you’ve been following the advice on this blog, you position yourself as a professional freelancer. Clients are attracted to you through your website, blog, social media, and expect to have a professional working relationship with you. However, a client who enquires with you is not actually yet a client – they’re a lead. They’re someone who has shown interest in your work, respects your creative skills and believes that you can deliver a good outcome with their project. However they’re not yet committed to you until a contract has been signed. They could also be enquiring with several other creatives. During the pre-contract phase, there’s equal chances of them working with you and working with another creative. The moment a potential client contacts you is the greatest opportunity for you to provide them with the best onboarding experience. How can you make their experience with you in the pre-contract phase, seamless, memorable, and professional, in order to increase the chances of a signed contract? Clients are busy people – you don’t want to waste their time. It’s in your best interest to make it easy for them to learn more about you, your services and your process. If you can provide them with all of that information upfront or in a streamlined way, this is going to save so much time compared to a creative who doesn’t offer any off this up front, and a client will value that. You’ve likely had a few clients by now so you should have a good idea of the common things clients are going to want to know or learn about you and the way you work. Providing them with the answer to those questions early is going to make their decision of working with you much easier. This could be things like your Creative Process, an Onboarding Questionnaire or a Welcome Package. Any gaps that you leave, the client is going to fill them in with their own guesses. The more you can provide them with these resources and the answers to their future questions up front, the less time it will take for you to communicate that information and the more professional you’ll be positioned. It shows you’re experienced, you’ve done this before and previous clients have trusted you and had successful outcomes. You don’t want to waste your time reiterating the same things to each prospective client. That’s going to be a waste of your precious time. Streamlining this workflow into an Onboarding Process is going to be super beneficial for both you and the client. It gives you more time to focus on current projects, and it gives the client all the information they need up front to make an informed decision. Below are some recommendations of what you could be doing as part of your on boarding process. While it will require some time and effort to set up in the first place – once it is set up it will do all the work for you and save you so much time in the long run. Your portfolio is more than just a website – it’s a marketing site. It’s a place where you should be selling yourself, your services and showing potential clients what you have to offer. Transparency means laying it all out for the client; who you are and what you do, case studies on previous projects and testimonials from past clients. This is going to make their decision making much easier when they can see how you’ve worked in the past, who you’ve worked with and envision how you would work with them on the project. Honest testimonials from past clients are going to be the tipping point for those that are on the fence. If you don’t have any testimonials, make it part of your routine when you finish a project to ask the client for one. Barbara’s Notes: Learning how to generate ‘effective’ testimonials is an important part of marketing your business. Raving, detailed testimonials from happy clients can ‘pre-sell’ your services for you. The more you have on your website and in your printed materials, the better. If a client is having to chose between two equally talented creatives, they’re likely going to start digging to uncover how you work and what your process is like. Many creatives unfortunately don’t have their Creative Process available to the client, so having this available to the client will already position you above the majority. Showing clients how you work and what the process will be like is hugely valuable for them. If they can see up front the process that will be undertaken, they’re going to be more inclined to want to work with you (provided you have a good process!). From your creative process, they’ll also be able to see the services you don’t provide – meaning they can move on to another creative that does offer those services instead of wasting your time. A creative process sets expectations and outlines your role in the project. This could be in the form of a Process page on your portfolio website like Sarah Dayan, or a PDF guide like we offer. Barbara’s Notes: I recommend offering both of these for your prospects. A free downloadable PDF and a “Process” page or FAQ page on your website. Some people want something they can print out and read later. Others want the information online. It’s in your best interest to remind the client of your talent at every opportunity during the on boarding process – testimonials being a good way to do so. Re use testimonials by placing them close to your Creative Process to remind the client of the positive satisfaction received by your past clients. Barbara’s Notes: I recommend including testimonials as many places as possible – on every page of a website, on your free downloadable PDF, in your e-Newsletter. They provide incredible social proof that sells your clients for you, without you having to do so. Clients (often) aren’t creatives. It’s unfair to expect them to know which information and details you need to gain enough understanding of the brief to put forward a proposal. Pre-emptying the details you require to make informed decisions and good judgements on the project is better done as early in the process as possible so as to not waste either yours or the client’s’ time. Having a questionnaire can help uncover some of this detail. The goal of a questionnaire is to uncover the value of the project through value-leading questions, so you can price it accordingly. It helps you decide whether it’s a project you’re interested in taking on or not and ensures that you get the answers to the right questions, up front. On the other hand, having a blank contact form or just your email address on your site is great way to waste time as you’ll end up in this back and forth of trying to get the answers from them. Have a look at MOWE Studio or Kyle Adams to get an idea of how an on boarding questionnaire could work. If you don’t have the resources to build it into your site, you can always use something like Typeform which is free. The best part of an on boarding questionnaire; it requires effort from the client. Therefore it weeds out the clients that ‘can’t be bothered’ answering the questions – you don’t want to work with them anyway. Barbara’s Notes: This is something I highly recommend and help my clients build into their sales funnels as well. Every step of the way you want to have pre-qualifying steps that your potential clients have to go through to work with you. If they want you to come out to their house and provide free design advice, then you want to know that up front. Pre-qualifying leads is an important skill every designer needs to learn and master. Even if you have a thorough on boarding questionnaire, questions could be misinterpreted or answers given by the client could be vague. Their responses also may pique new questions in your mind, or identify areas that need to dig deeper to get a better understanding. Refining the brief may be necessary to do so over a phone call or Skype session. Make sure you fully understand the brief before moving forward with a proposal. Don’t be shy to ask for clarification. Misunderstanding the brief can not only lead to a misaligned proposal, but also to you undervaluing the project. If the client is honest, they’ll let you know and probably give you another opportunity to present a proposal after some discussion. Make sure you have everything written down. When in doubt of whether you’ve understood correctly – re iterate back to the client in writing. This way they’ll be able to see your interpretation and suggest any corrections if necessary. Barbara’s Notes: How effective is your questionnaire? You’ll want to be sure to include strategic questions that will provide the kinds of answers you need to know up front as to what kind of client will they be. Not just design questions such as colors, furniture styles, usage, etc. However, be careful not overwhelm them with too many, in depth, questions. I recommend having your questionnaire on your website. It’s far more convenient for you and impressive to your clients. It shows them you’re up to date in this digital age and using your website as an effective tool. Here’s a basic interior design questionnaire I found on Pinterest. If you click on it, it will take you to several more. You can also do a Google search for “interior design questionnaire”. I found it to be super informative to see what others are doing, offering, etc. Up until you’ve managed to streamline the majority of the above steps. You’ve saved yourself and the client time, and expedited the process of getting from inquiry to client. Now is the part of the process that can’t be streamlined – writing a proposal. Proposals outline the brief, scope and value of the project. They’re your opportunity to define what is and what isn’t included in the brief and present the cost. Establishing the responsibilities and roles of both you and the client is important in the proposal too. It’s not uncommon for clients to think that you handle all the work and they sit back and do nothing. Maybe you need assets from them, their time to proof, review or provide feedback, a brainstorming session together, resources they already have etc. Using nice and easy proposal software makes this process super easy. It gives the client the opportunity to easily accept, decline or request changes. Some also support electronic signatures which saves them the hassle of printing and scanning. Once you’ve sent the proposal to the client – it’s in their hands. You’ve done everything you can to provide them upfront with as much information about you and your services as possible, uncovered the value of the project and refined the brief. Now it’s up to them to review your offering. When a potential client first enquires with you – they’re not your client, yet. No proposal has been sent and no contract signed. You play a big role in the potential of turning the potential client into a client, and it requires more work than just having a portfolio like many creatives do. Spending one day putting effort into creating or refining an onboarding process is going to pay off so much in the long run by saving you time and increasing your chances of signed projects. To create a successful onboarding process; consider the experience your client has with you every step of the way, and make this experience remarkable. Communicate with them every step of the way and exceed their expectations. Barbara’s Notes: Taking the time to carefully examine what your potential client experiences BEFORE they contact you and AFTER they contact you, can be very revealing as to why or why not you may be signing these new clients. It’s easy to see why some interior designers are not getting the number of jobs they want and the type of high end work they desire. After they become one of my coaching clients, they’re eyes are opened and they experience many “a ha” moments. Once they make the necessary changes, they start getting such remarkable results! The client’s experience with you is in your control – whatever experience you provide them with is going to set the expectations going forward so make sure it’s a good one. Make their decision to work with you as easy as possible. Femke is a Digital Designer and lover of side projects. As a co-host on the design podcast Design Life, Femke enjoys talking about issues freelancers face as young creatives. If you’d like to talk about general systems and how having an onboarding system could help you increase your productivity and sign more high end clients, feel free to get in touch today. I’d love to help you grow your business! Great info!! I plan to use it very soon.